Lightwater Valley is set to be transformed into ‘Frightwater Valley’ as part of its spooky Halloween celebrations (October 27th-31st). 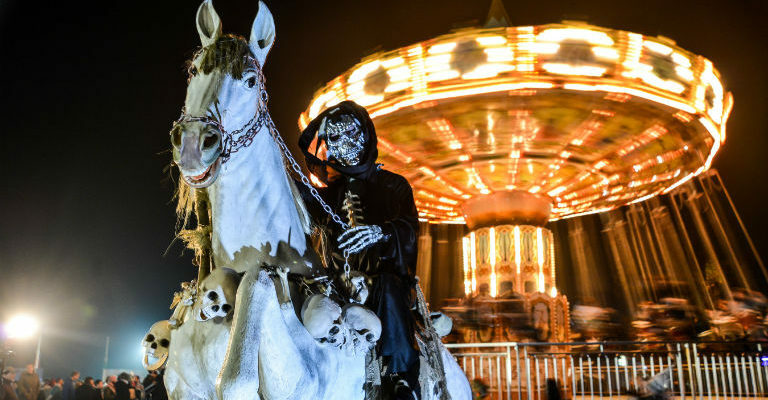 The North Yorkshire theme park will be hosting a series of spooktacular events and activities designed to appeal to visitors of all ages. From family-friendly scares to truly terrifying encounters there’s something for everyone to enjoy. For younger visitors there will be Spooky Character Meet and Greets (9.30am-midday), Scary Magic Shows (12.30pm – 1pm, 2pm – 2.30pm, 4pm – 4.30pm) and Trick or Treat Doors (11.30am – 12pm, 1pm – 1.30pm, 2.30pm – 3pm, 4.30pm – 5pm). Visitors can also join in the frightful fun as part of the Halloween Fancy Dress Competition which will be taking place on the Lightwater stage between 3pm-3.30pm each day. For the more intrepid there’s the chance to enjoy some grown-up thrills and chills inside the Live Scare Maze in the Events Hall and the Scare Maze Walkthrough in the Marquee; both of which will be open for risky business from 1pm. The mazes are definitely not for the faint-hearted and are not suitable for children under the age of 12 due to the extreme nature of the scares. The scares culminate with the Frightwater Finale lakeside fireworks spectacular (6pm Saturday, 5.30pm Sunday-Wednesday). Among its signature rides is the 1.5 mile long Ultimate rollercoaster – the longest coaster ride in Europe – and the Eagle’s Claw aerial ride.